The first half of this past week flew by, a blur of class and reading and clients and work. The second half screeched to a halt with the arrival of a fall cold and a middle ear infection, which forced me to slow down and spend most of yesterday curled up on my sofa. I was supposed to travel to DC today for my cousin’s baby shower, but, with my first set of midterms coming up this week and more travel on the horizon later this month (not to mention the undesirable prospect of getting other family members sick! ), I chose to stay home and rest up. I’m not a good patient, and I don’t like slowing down, but seasonal sniffles are an important invitation to give our bodies care and attention. Since it’s gloomy and drizzly and cold in New York this weekend anyway, I’m hunkering down with lots of soup and lots of flash cards. And I’ve gotten some pleasant distraction from the following recipes and reads. 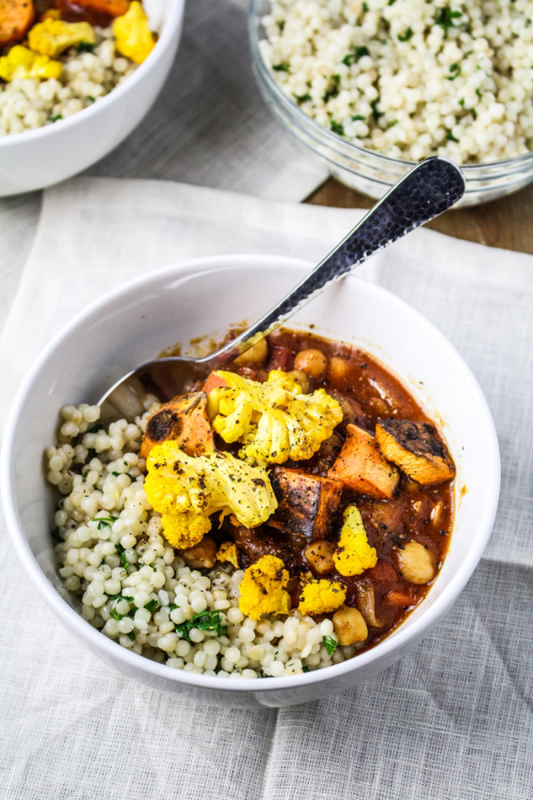 I love this colorful, meal-in-a-bowl recipe from Katie at the Kitchen Door: Middle Eastern chickpea and cauliflower stew. So much flavor, texture, and variety in one dish, not to mention a rich array of spices. 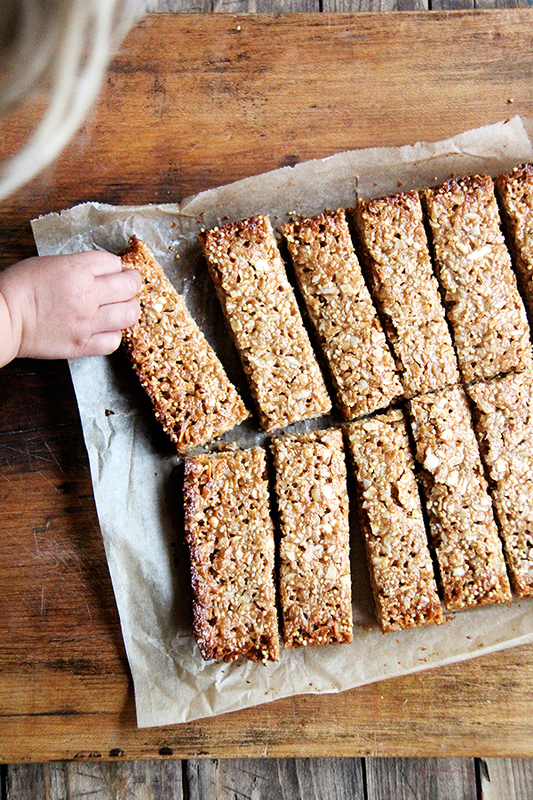 It’s back-to-school season, and whether you’re feeding yourself or your kids, it never hurts to have another homemade snack bar recipe handy. I love this recipe for coconut-almond granola bars from my friend Alexandra–it’s easy to make and the bars look scrumptious. 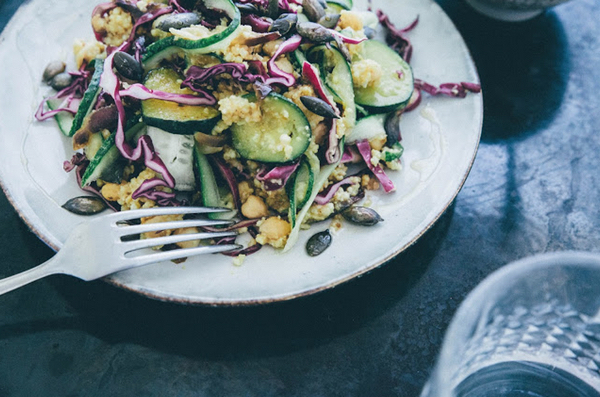 Another one-plate meal that hits on so many of my favorite ingredients and flavors: millet and chickpeas with smokey zucchini and vegetables, served with sauerkraut. Recipe via Eat and Love. 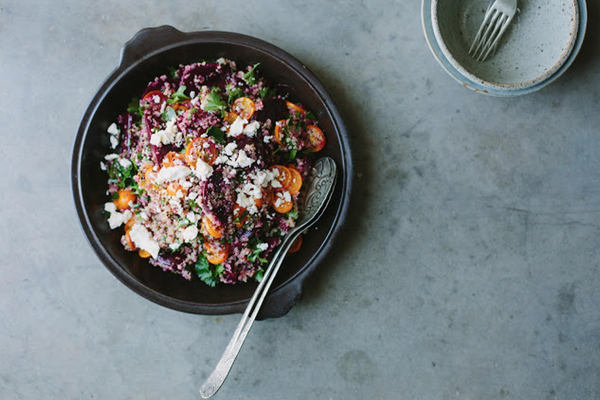 My Darling Lemon Thyme’s beautiful baby beetroot, quinoa, and kumquat salad is full of color, and it would be a lovely appetizer or side dish for fall or winter entertaining. There’s feta as written, but cashew cheese or tofu ricotta would both work well as a replacement (or you could skip them both and add chopped avocado, toasted nuts, etc.). And finally, dessert. 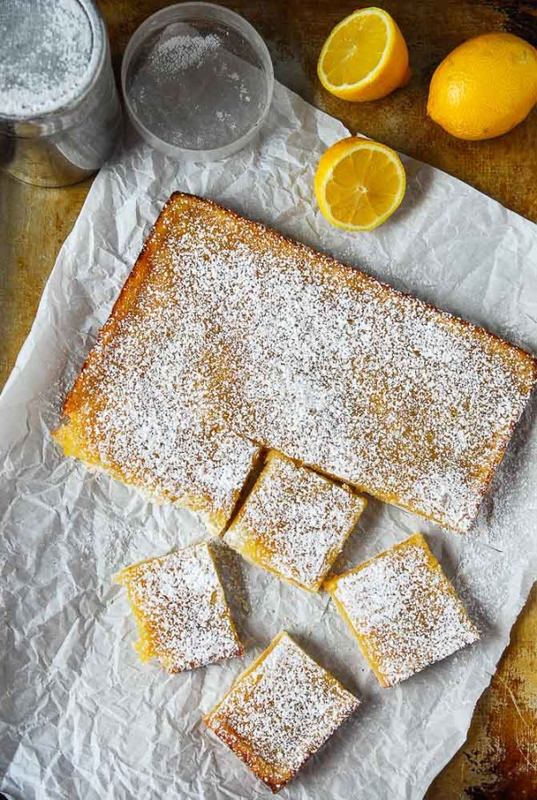 Abby of The Frosted Vegan has created the most authentic-looking, beautiful vegan lemon bars I ever did see, with a rich shortbread crust. I would imagine these make for wonderful edible gifts around the holidays, so I’m bookmarking the recipe! 1. An article and video documentary, via the New York Times, about how ebola survivors are overcoming the stigma associated with the disease–and channeling their life affirming energies into the game of soccer. Very interesting, both as a human interest story and as a study of the cultural attitudes that surround infectious disease. 2. It’s worth reading the fabulous and articulate Miyoko Schinner‘s letter exchange with Ryan Bethencourt, relayed in Medium as part of the magazines “Future of Food” series. 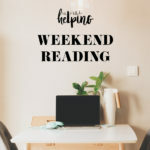 I’m linking to Miyoko’s third letter, but you can read it and track back to the other two exchanges, which surround such issues as sustainability, hunger, technology and food innovation, and the necessity of helping consumers to reconnect with the process of cooking. I think Miyoko articulates the vegan perspective calmly and persuasively, but with a lot of compassion and a broad perspective. 3. A fascinating article, via Aeon, on the phenomenon of hearing voices and whether or not it can ever be regarded as a therapeutic tool. We tend to look at hearing voices as a symptom of mental illness that begs correction, but the author sheds light on a growing “hearing voices movement,” in which those who do hear voices claim that listening to and analyzing what’s heard can help to resolve or shed light on trauma and personal history. I have no doubt that this is totally situational–for some, hearing voices may be an intolerable burden, while for others, it may not be. But I was interested in the perspective that these voices might not always be a source of dissonance. When my grandmother was slipping into the end of her life and experiencing dementia, she often seemed to recognize individuals who weren’t there, or to hear the voices of loved ones who were gone. It was distressing to watch, but what I realized over time was that many of these perceived characters from her past were offering her comfort and solace as she journeyed to another place. I know that this is different from apprehension of voices in the midst of youth or middle age, but the article reminded me of it. 4. Abby Norman has written a terrific article on the phenomenon of pain and how it intersects problematically with medical practice. Why is pain so hard to communicate for both patients and physicians? Why are doctors so often made uncomfortable by the condition of chronic pain? Are there ways for doctors to become more sensitively attuned to their patients’ experience of pain? All important questions, and Norman describes some promising strides forward (such as the keeping of pain diaries) in this area. 5. Finally, on an upbeat note, a cool profile of four rockstar female chefs and their perspective on the industry and how it has changed in the last few decades. And with that, I’m off to study. I hope you all enjoy a great weekend, and I look forward to sharing my updated, weekly menu plan on Monday! Wishing you a quick, full recovery, Gena! Oh dear Gena, thank you SO much for including my recipe! I haven’t made those bars in quite some time, so I think it’s time to re-visit 🙂 Have a wonderful weekend and I hope you feel a million times better! I look forward to Sunday’s and Weekend Reading, but rarely share this with you. so….thanks for your round-up. It’s always amazing. That means so much to me. I love putting these posts together. Thank you for telling me! Gena, wishing you a fast recovery and lots of luck on your upcoming midterms — don’t know how you do it! Finally, I watched Cowspiracy the night before your Vegan Cookbook (!!! a beauty!) arrived, and I am feeling completely inspired. Soaked cashews to make milk as well as steel cut oats. Question: I left the steel cut oats soaking for 12 hours (oops!) — should they be OK? Or is this something that really should be a quick soak? I leave soaked oats out overnight or for 8-12 hours frequently, and then I cook them in the same soaking water. It’s never a problem for me. For cashews, I usually change the soak water before making milk. It’s also fine to leave the soaked oats in the fridge, and then you won’t have any nagging worries about the temperature issue! But to answer the broader question, I actually think the oats are easier to cook the longer you soak ’em, so 7 hours is my minimum. You’re good. I hope you liked Cowspiracy – it’s definitely a galvanizing movie, and I actually watched it on Friday for the first time myself! OK, got it, I ended up puréeing them and using them as milk — our house is cold! — and it worked just fine, but I will think more about temperature in the future. I can’t get enough of the cashew milk! I find myself craving it throughout the day and downing glasses here and there. So so good. Gena, how is your dietetic program going? What classes are you taking this semester? Hope you’re enjoying it and would love an update! wow, cashew milk is delicious! just had my first vegan bowl of muesli. I’m feeling inspired! Great recipes & articles (I’m especially eyeing up the one from Miyoko).